Save up to $22 per person! Enjoy Vancouver’s famous 400 hectare Stanley Park. Along with a 24 hour Hop-On, Hop-Off Sightseeing Pass, included is a one-hour horse drawn carriage ride and admission the Vancouver Aquarium! Spend your time in Stanley Park! 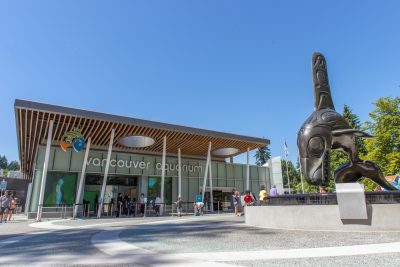 Featuring miles of twisting trails beneath old-growth trees, Canada’s largest aquarium, and even an outdoor summer theatre, Stanley Park offers something for everyone! 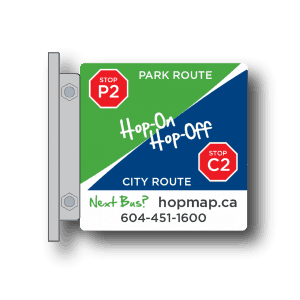 Start with our popular Hop-On, Hop-Off Sightseeing Pass where you will discover everything from natural wonders of Stanley Park. Included in your explorations of Stanley Park are admissions to the Vancouver Aquarium and a scenic Horse Drawn Carriage ride. Our DUAL Pass is a fun and flexible way to see the best of Vancouver! This ticket gives you unlimited access to all of the highlights and stops available on both the CITY and PARK Routes —a total of 29 stops! Are the Stanley Park Horse-Drawn Tours wheelchair accessible? Yes, select carriages are wheelchair accessible. Reservations are required. How many passengers can fit in the carriage? The carriage can seat up to 26 passengers. What should I wear during the tour? The carriages are covered and blankets provided, but we recommend dressing warmly. What time do the Stanley Park Horse-Drawn Tours run until? 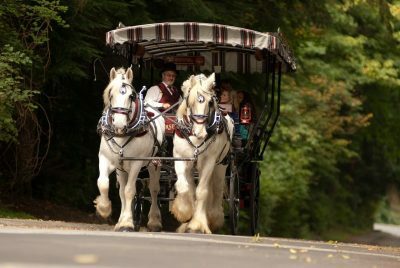 Stanley Park Horse-Drawn Tours runs every 15 to 20 minutes from 9:40 a.m. until 5:00 p.m. during the summer season. Closed from November to March. Please note that hours of operation may be changed due to special events. We recommend contacting us at 604-451-1600 for the latest information. Is the Vancouver Aquarium wheelchair accessible? Yes, the Aquarium is fully accessible including designated wheelchair spots for shows and wheelchair accessible washrooms. Remember that the Hop-On, Hop-Off buses and trolleys cannot accept wheelchairs. What can I see at the Vancouver Aquarium? The Aquarium is home to a huge variety of creatures including jellyfish, sea otters, sea lions, frogs, birds, reptiles, and more. What time is the Vancouver Aquarium open until? The Vancouver Aquarium is open from 9:30 a.m. until 6:00 p.m. Please note that hours of operation may be changed due to special events. We recommend contacting us at 604-451-1600 or their website for the latest information. Depending on your purchased route: The CITY Route takes approximatley 1.5 hours, and the PARK Route takes 2 hours.